Why did I just pay 3 dollars for a microphone worse than the one that comes with my phone? The app constantly crashes. I cannot edit recordings after buying all the add-ons. No support either. I use it to capture musical riffs and licks. The quality is awesome. I’ve done a whole show from my phone. Love it! Tried it after having not tried but on my iPhone. Red button was just “re-start”; trying to stop, and went on without stopping for over 4hours!! Looked for silver bullet or sage infused stake; not to be found!! Deleted app. Scary! 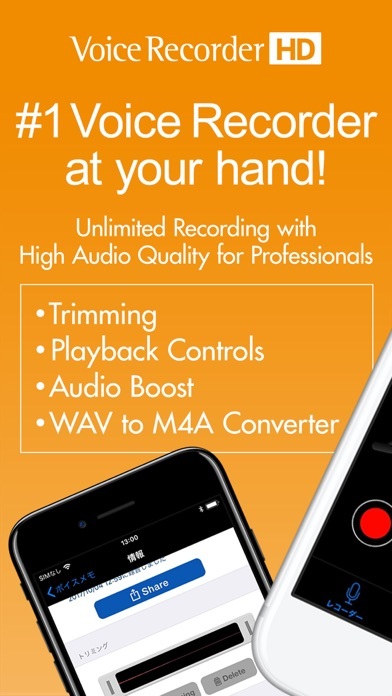 Does everything you need to record and share an audio file! Not what you think your getting. Downloaded this, only to discover that virtually every useful thing (ex. Recording sensitivity)requires a separate purchase to either activate or use to its fullest extent. Calling this a deceptive piece of software is an understatement. This is my go to recorder! the whole reason i bought this app was that supposedly background recording was a function. well it completely shuts off when using Skype, foreground or background. and there is no customer service or email at the developer website. very frustrating. This is one of a couple of recording applications that I use on my phone. 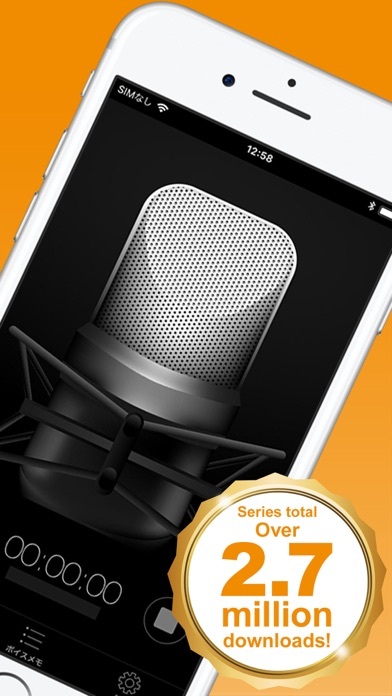 The iPhone microphone in conjunction with this app gives me excellent recording quality for audio notes. I am a singer-songwriter and I am able to record, export, and share these recordings. Indispensable. Update from previous review. I had recorded My wife at doctors visits. She passed away from heart cancer 12/20/2016, and now I can listen to her voice on these records!! I’m so happy to hear her and this app works great!!! 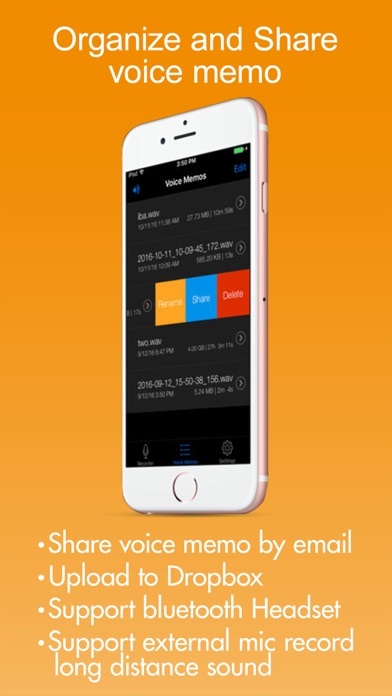 It has every feature you can imagine l recommend trying this app for important notes and mementos of loved ones voices. I restored from my iCloud backup that shows my voice memos that are stored on. No voice memos came back. You offer too little and require too many purchases. Apple GarageBand makes you guys look a little stupid. Sorry. This app is exactly what I was looking for - it records perfectly- even if I’m across the room. One request I would love is if they had the play back or replay speed at 1 1/4 and 1.5 not just one time or two times the speed - sometimes I just want it to speed up a little bit or 50%. Thank you for your fabulous product! The developers seem to keep up with updates. The only thing is when I record the audio playback isn’t that great. It’s like I’m speaking through muffled microphone or something. The user interface is pretty great. Please fix the sharing button. It doesn’t work. My files are stuck on the phone if I can’t share. Otherwise a good high quality recording app. I grab this recorder all the time to sing song ideas and make reference recordings. Very grateful for this tool which I am relying on more and more. No matter how hard I try, there is a clicking sound at the start of every single recording. WHY? Misrepresentation in terms of what it does. so far, I have no complaints. It works really good, I use it for my projects, I can send felt back-and-forth from my iMac easily and effortlessly. adding to my review, again, Great product! I've been using this App for several years. I am continually pleased with the results I get. I record notes for jobs, short meetings and religious talks that I wish to share with others. I also like the new touch security feature. All in all this app is fine. Trimming is very very difficult. I probably will try to stop and start more accurately then try trimming. I bought this app assuming that at least the basic features come with it. You have to purchase basic features such as playback controls separately. This app will seem to be recording but then never list the recording iThis app will seem to be recording but then never list the recording in the recording list. 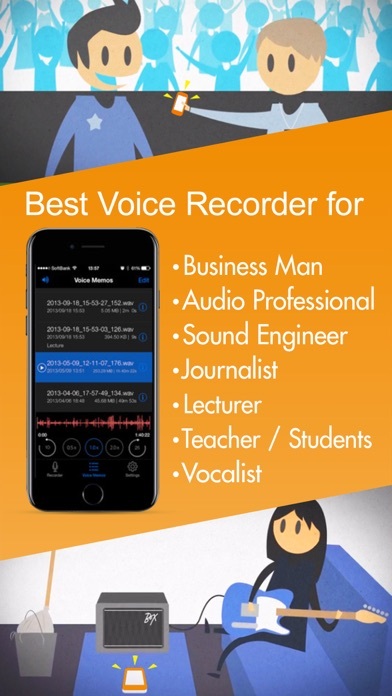 It also will show a recording in the recording list but, if you select that recording, the app takes you to a different recording. It also is very non-intuitive. It seems like the makers of this app really were just trying to create something with which to try to sell more addons - which is crazy since the app is so useless. A good old fashion digital dictaphone is much more useful. I liked the app that came with my old iPhone 4. This one is more cumbersome, and fails to record audio sometimes. I'm looking for a better app. This is a great app I use professionally to gather sound. The recording is good enough to use professionally. It's super easy, renaming each track and the ability to share each track multiple ways is a help. Be aware, this is NOT a sound editor. This is for recording only. But the interface is good and I've recorded everything from background sound to testimonials to interviews, all used on the radio, easily with great results. If I could improve it, I would enjoy being able to edit them in this app too. You have to buy play back. I bought this app despite the fact that there are lots of free ones because in the description when I looked at the In App purchases nothing showed up. I thought this app was everything I needed. No ....if you want to play back you have to pay for it if you want to convert to MP3 you have to pay for it the list goes on and on. This is for an app that already costs . I want my money back huge rip off ....sleazy. Works great, but playback scrubber and timer freezes when you manually scrub through recordings. Could this be fixed in a future update? Needs a couple more things. These in-app purchases are a racket. You guys must not know what Trimming is. In your app there's no difference between Trim and Delete. You should have made it possible to cut out dead air in a recording and splice the remaining pieces together. Simply shortening a recoding by deleting the beginning or end is not very useful. Enjoy my 99 cents you charged me for this bogus feature. Don't spend it all in one place! Also, please add the ability to record phone conversations. Contrary to popular misconceptions, this is NOT illegal to do. It depends on each user's local laws. It IS legal in many areas to record your phone conversations and it's a VERY helpful function to have; especially for business. Finally, Dropbox and email are fine for somethings but those don't really work in every situation. This needs the ability to simply send an audio file via text message. Please add this. Otherwise, I love this app. It got me through some very complicated lectures in college. I'm amazed at how good the recordings come out. I use it to record new songs from friends to learn. It's simple to use, and high quality recordings. I cannot get this app to work. It doesn't save the files to the app itself, or to the Dropbox folder it set up. I tried to get help from Support but no response at all. I wasted my money and a lot of my time. Works great. $0.99 premium features well worth it. This is an indispensable tool for my business meetings to make sure I get and retain all of the important details afterwards. I was initially frustrated by the lack of playback features, not to mention trimming capabilities but later discovered that they were available for a mere $.99 each. So I paid two dollars for an extremely effective business tool. Highly recommend it. This app does not work at all. Support is non existent. I want my money back!!!! 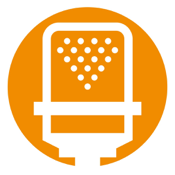 I use with a lav mic then upload to Dropbox directly from the app. Useful to share with my editing team and to keep records. Quality of recordings are like you are there. Just attended a Willie Nelson concert & the replay sounds like you are right by him... It is without a doubt the # 1 recorder!!! My most essential app, it constantly amazed me. I always find this app useful and perfect for my daily recordings. I enjoy taking voice notes and doing diction on a number of various ideas. I also love those additional feature especially the audio boost. It really capture the sound even from the far distance. Thanks for the fix! Keep up the good work! I recorded a lecture this morning. Or so I thought. I noticed the timer going and going, but when I checked for the file, it was nowhere to be found. What a ripoff. What a joke. Don't waste your time with this garbage. For years I've enjoyed this recording App. Whether it's myself singing, my boyfriend talking in his sleep or directions/memos for later.. I've found this app to be fun, reliable and enjoyable. Can't get app to list recordings for playback. Pls help or refund my money. Great program, but why did you change the icon. The new one is awful. Please change it back!!!! Does exactly what it says it will do. And does it well. Please change the icon color, it's hard to spot now. A number of times I have recorded something I really like, and then when I press the stop button, the recording is supposed to immediately send to the list of recordings, but it does not. I lose the recording, major flaw, major bummer. Sound quality is good apart from that issue that makes this app kinds useless. Please switch back to the old icon. It's simple, easy to be stood out among other icons, especially the red color. Thank you. This is a great app except that the blinking red during recording is obnoxious. There seems to be no way to turn off the blinking. I've been using this app for over three years. I've used it to record my kid's concerts, meetings, phone conversations from speakerphones. It's worked in all situations and I love it! I wanted to vary playback speed this cost to extra. I wanted to boost the base so I bought the higher fidelity which didn't boost the base. I wanted to trim which costs extra. In the end I paid a little over $5 for the app. Don't know if that is a good deal I wish I could vary speed in 1/4 increments. I wish I could set tags so I could rewind and play segments for music practice or clarify speech by listening repeatedly to segments I define. Have used this for over a year for interviews. It's outstanding. We have used this to record church services for over a year, then transfer to Audacity to edit before uploading. Very straightforward, never had a problem. Works good, simple and reliable. I use it all the on my iPad Air 2. Amazingly good mic range. music quality is good. Had it for ever, good app. It does playback your recordings. You only have to pay for "advanced" playback options. I had to amend my review..tap on file to open play button. I love the older version better because it doesn't shut down when I get a text. The recording always shuts down immediately when I get a text or an email which makes this app kinda useless now..
I’ve used this weekly for 5 years to record weekly sermons live during church service. Works exactly as expected. This app has the potential to be the perfect audio recording utility, but unfortunately, it has a glaring and negligent flaw: it plays audio back through its own non-standard interface, not through Apple’s API. This means NO Control Center controls, NO Airplay, NO Bluetooth. It’s extremely disappointing. Declining application, too many updates, appearance changes! Still my favorite voice recorder. Good quality recordings. Transcription is great for memorializing conference notes. I’ve purchased some of the add-ins and each was well worth the money. But, the new brighter icon doesn’t seem quite as Pro for a productivity app. It’s easy to use! I paid for some extra features and I’m able to convert the wave files to mp4 files. This allows me to upload the audio files to my blog or email audio files to my clients. Love this app! I use this app frequently and it does a good job. Some improvements; The transcrbeMe requires a Pass word that no information was given to try to use this feature. Boost the listening and audio to provide a better operating system. 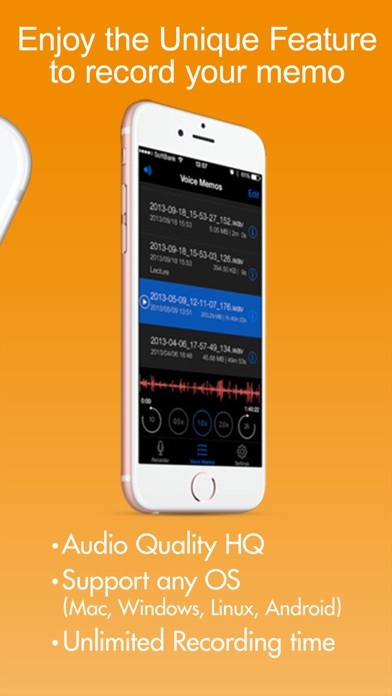 Please tell me why this app used to be the best in audio recording but now the app crashes all the time. I paid for the additional things like trimming and such but the app crashes before I can use them. Terrible terrible app! Glitches out and fails after a few seconds. Lost important recording.